More recently, acid attacks have been made against children, older women, and men. These attacks have been associated with dowry demands, land disputes, and revenge. Whatever the motivation, the consequences of acid violence are life-changing for victims. After-effects include physical and emotional scarring, multiple surgeries, and a lengthy process of rehabilitation. In the majority of cases, a victim’s education is permanently interrupted, and her chances for marriage destroyed. This translates into abject poverty. 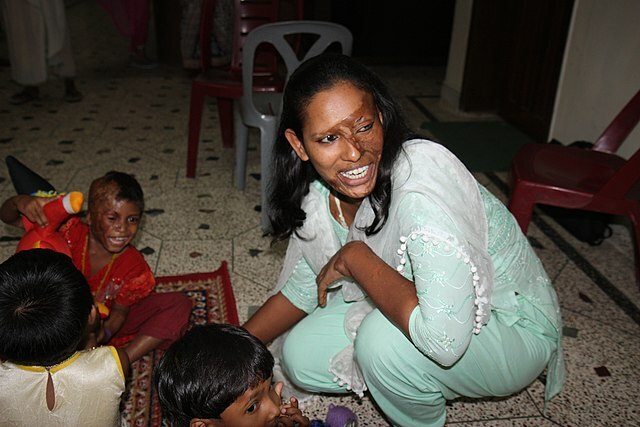 The Acid Survivors Foundation is one organization which supports the victims of acid attacks. ACF assists with medical treatment, physical and psychological rehabilitation, job training, and reintegration into society. The scars from acid violence remain a lifetime. But with help and courage, victims can find the strength to go on with their lives. Acid Survivors Foundation, “Acid Violence”, http://www.acidsurvivors.org/Acid-Violence. These countries should evolve, plus I´m sure the man got a free pass. They are sort of stuck in between the modern western society and old traditional out of date values that they have. And basically keeping women as slaves, they might dress well and go to great restaurants, but the “free choice” for them is very limited if none. Sad but true. Sometimes though it is the difficult things that bring out our strength. Not just the evil, but the arrogance astonishes me. That one person would believe himself entitled to do this to another. A picture of strength and a survivor she is. Beautiful she remains inside as well as out. Tragically, acid violence is not considered despicable in all cultures. It means a great deal that good men like you do recognize the practice as evil.